Hunchback had the player cast as Quasimodo, on a perilous mission to rescue Ezmarelda, batting arrows, spears, and fiery boulders amongst other things, in order to reach the incarcerated Ezmarelda. 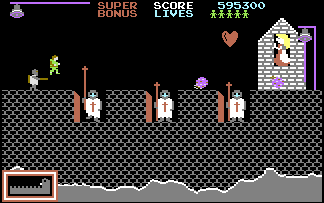 Released in 1934, Hunchback is surprisingly good arcade conversion, and still as addictive (and frustrating) as ever. Not that anyone cares, but the cover artwork on Hunchback (by the legendary Bob Wakelin) is my favourite C64 game artwork of all, though apparently, Bob Wakeline hated it!